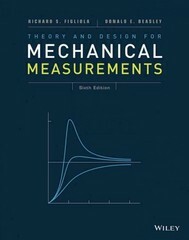 Theory and Design for Mechanical Measurements 6 Edition Figliola and Beasley’s 6th edition of Theory and Design for Mechanical Measurements provides a time-tested and respected approach to the theory of engineering measurements. An emphasis on the role of statistics and uncertainty analysis in the measuring process makes this text unique. While the measurements discipline is very broad, careful selection of topical coverage, establishes the physical principles and practical techniques for quantifying many engineering variables that have multiple engineering applications. In the sixth edition, Theory and Design for Mechanical Measurements continues to emphasize the conceptual design framework for selecting and specifying equipment, test procedures and interpreting test results. Coverage of topics, applications and devices has been updated—including information on data acquisition hardware and communication protocols, infrared imaging, and microphones. New examples that illustrate either case studies or interesting vignettes related to the application of measurements in current practice are introduced.